There’s something precious about a recipe passed down from one generation to another. Whether handwritten or, in this case, typewritten, it becomes a tangible symbol of a special relationship. 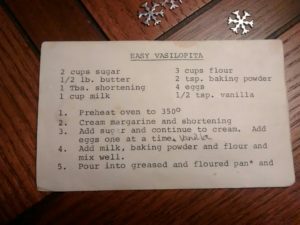 This typewritten recipe for an “Easy Vasilopita” was given to Andrea, chair of our Traditional Attire & Decorative Arts Department, by her Nouna (Godmother), who was first generation Greek-American with roots in Sparta. Unsatisfied with her family’s practice of using boxed cake mix, Andrea was happy to upgrade to this simple but tasty cake-like vasilopita. Add sugar and continue to cream. Add eggs one at a time. Add vanilla. Add milk, baking powder, and flour, and mix well. Pour into a greased and floured pan and bake for one hour. Sprinkle with confectioners’ sugar and cool. 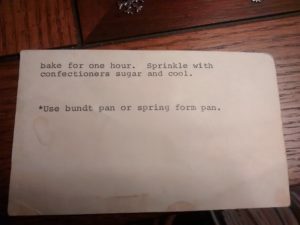 Use a bundt pan or springform pan.